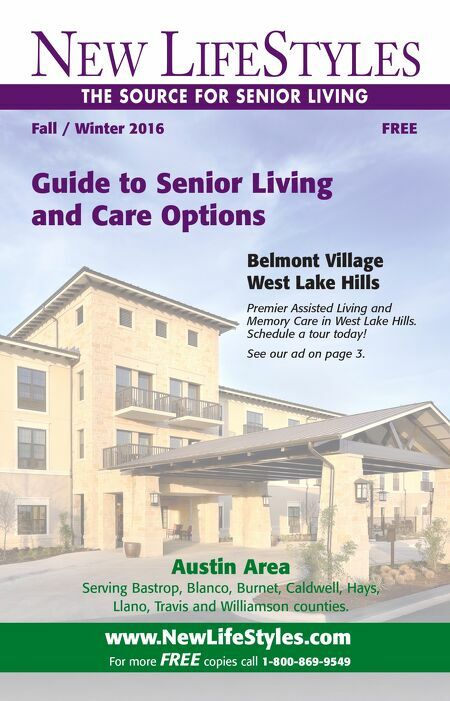 For more FREE copies call 1-800-869-9549 Guide to Senior Living and Care Options www.NewLifeStyles.com Fall / Winter 2016 FREE Austin Area Serving Bastrop, Blanco, Burnet, Caldwell, Hays, Llano, Travis and Williamson counties. Belmont Village West Lake Hills Premier Assisted Living and Memory Care in West Lake Hills. Schedule a tour today! See our ad on page 3.